Blind people can still lead normal lives and do most of the things that perfectly healthy people can, but one would imagine that riding a skateboard isn’t one of them. Well, this 20-year-old blind skateboarder proves otherwise. Known as The Blind Rider, Marcelo Lusardi lost his sight completely two years ago, when he was diagnosed with Leber hereditary optic neuropathy (LHON), an incurable genetic disorder caused by mutations in mitochondrial DNA. At first, he started seeing a kind of stain in the vision of his right eye. Soon after that, he lost the vision of his right eye completely, and if that wasn’t devastating enough, doctors informed him that LHON had affected his left eye as well, and that he would soon become completely blind. Born in Argentina, but currently living in Santiago de Compostela, Spain, Marcelo Lusardi remembers that he lost his vision so fast that he couldn’t even come to terms with it before it happened. He went into a depression, as he couldn’t even imagine living without sight. Luckily, a friend of his father’s stepped in and helped him accept his condition and push himself harder instead of giving up. Marcelo says that without her help, it would have been impossible for him to get over his depression. Eventually, Marcelo Lusardi started getting out more and going to the skate park where he used to hang out with his friends, and try out new tricks. Only this time, he had to use a cane just to find his way to the park, so skating was out of the question. Or at least that’s what he thought. After a touching reunion with his skateboarding buddies, Marcelo Lusardi remembers them telling him that he was still one of them and that he had to get back on the skateboard. He somehow found the strength to do just that, but learned the hard way that skating blind was completely different. In an interview with Surferrule, Lusardi says that when you can easy, all you need to do is position yourself right before doing a trick and just execute it. But without sight, everything is different. He must first inspect and get accustomed to his surroundings before skating there or performing a trick, and sound helps him a lot as well. The way the different surfaces sound, the noise made by other skaters and even the people talking or cheering around him give him valuable information about where he is in relation to the bank ramps and other elements of the course. And he sometimes uses his white cane as well. 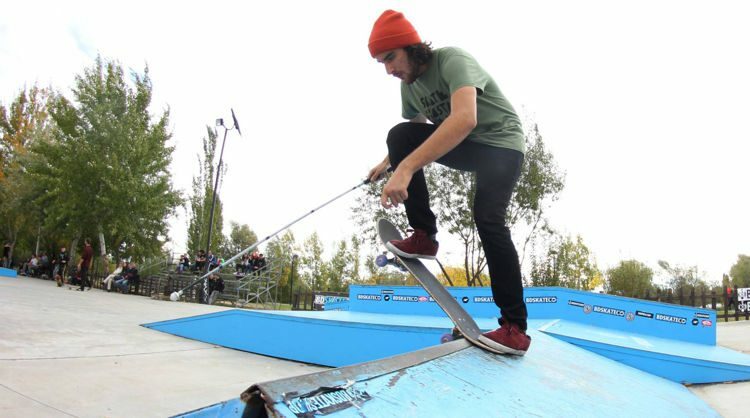 With the help of his friends and after learning to use his other senses and his cane to mitigate the skate park, Marcelo Lusardi not only learned to ride the skateboard again, but also execute tricks that not many people, even those with perfect vision, can do. The skate park he has visited since he was 11 years old is the best place to practice new tricks, but he can do them in other places as well, as long as he inspects the course beforehand. Marcelo still hopes that one day someone will invent a cure for Leber hereditary optic neuropathy, and he will regain his sight, but in the meantime, he is making the best of his situation and inspiring people in the process.